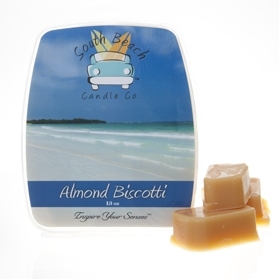 Almond Biscotti Scented Shell. This aroma opens up with vanilla notes and blends with mid notes of almond leaving the sweet aroma of caramel in the air. Burns up to 400 hours. It is suggested to burn one cube at a time. This aroma opens up with vanilla notes and blends with mid notes of almond leaving the sweet aroma of caramel in the air. Burns up to 400 hours. It is suggested to burn one cube at a time.